Friday, December 6 1907 --A play version of E.W. Hornung's Raffles the Amateur Cracksman opens at the Mason Theatre to a tepid review from Examiner critic Othemon Stevens. Stevens interviews a Pinkerton man and a retired police detective after the show, they poo-poo the concept of a high society gent engaging in criminal activities "barring high finance." Why indeed would a gentleman bother to get up from his mahogany desk in order to commit his robberies? Saturday, December 7 1907 --The original Santa Anita horse-racing park opened today for what ultimately would only be two seasons of racing. The park failed in part because new California laws made it impossible for bookmakers to ply their gambling trade. Larry Whittington achieved his dubious claim to fame for creating and then abandoning the comic strip Fritzi Ritz, which would later become a huge success under the guidance of its replacement cartoonist, Ernie Bushmiller. Various stories have circulated over the years as to why he abandoned the strip in 1925 -- some said he died, others that he couldn't meet his deadlines. But I'm happy to find that the websites I checked today all had the story right -- Larry dumped Fritzi Ritz in order to create a new strip for the New York Mirror, Hearst's entrant in the Big Apple's tabloid race. 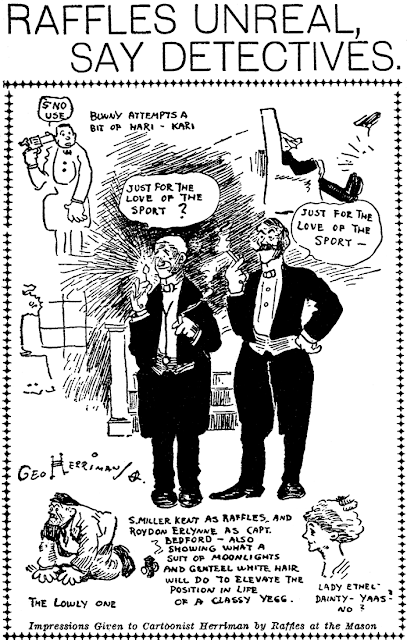 Whittington's last Fritzi Ritz daily was May 13 1925. Whittington wasn't much of an artist but he could draw a passable pretty girl. He stuck with that specialty on Mazie the Model -- pretty much a straight copy of Fritzi Ritz except that Fritzi was an aspiring actress. The series debuted on May 25 in the Mirror. Less than a month later the series was picked up for syndication by Hearst's King Features unit. Faced with a seemingly endless stream of flapper comic strip offerings, most newspaper editors greeted Whittington's effort with barely stifled yawns. Evidently, though, just enough picked up the strip to keep it afloat ... barely. 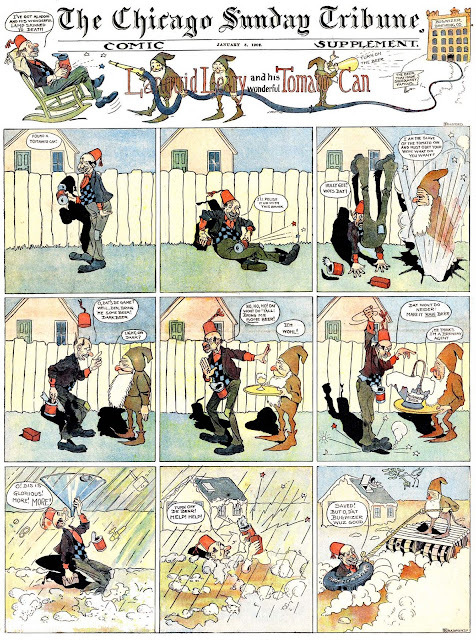 The strip limped along with a small client list of third-string city papers and small town journals until April 14 1928. The strip had a brief revival in 1930-31 when the backstock was picked up by a reprint syndicate, probably Columbia Newspaper Service, and sold once again to some penny-pinching smalltown papers..
PS -- You may be wondering why I keep referring to the strip by one name when the example above uses a different one. Answer is that for some unknown reason the paper from which the sample originated used a variant title. As far as I know King Features never sold the strip under that name. Speaking of the sample, is that not one of the worst conceived gags ever? In black and white, in which the strip was universally printed, there is no visual clue that Mazie's hair has changed color. What was Whittington thinking? Considering the never-ending reprinting of Schulz's Peanuts strip, it's surprising that it took over 40 years for someone to run with the idea of reprinting Sparky's other syndicated feature, the Sunday panel feature It's Only a Game.Granted, the feature was a flop in newspapers, and Schulz farmed out a lot of the work on it to collaborator Jim Sasseville, but still, we're still talking Schulz here. I've seen a partial run of these Sunday cartoons before, and I confess I wasn't all that crazy about them. The first and strongest reaction is that it seems weird for Schulz to be drawing adults. I mean Really Weird. Many of his adult characters look like grown-up, paunchy, worse-for-wear versions of Linus and Charlie Brown. It's a melancholy reminder of our own lost youth, even if our youth was as angst-ridden as Schulz's characters. The cartoons, as the title implies, are about games -- everything from football and baseball to cards, chess and horseshoes. Each Sunday featured one cartoon about bridge (a Schulz obsession) and two additional cartoons on other subjects. Schulz puts his own personal spin on these well-mined subjects resulting in worn gags spun in slightly different and interesting directions. 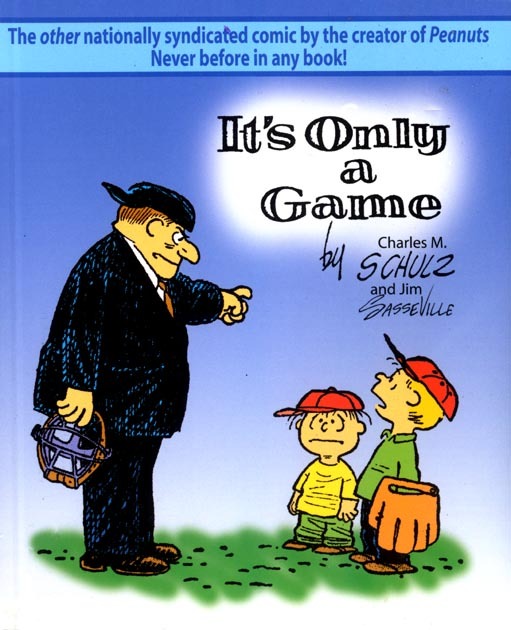 Jim Sasseville, who assisted Schulz on It's Only a Game, provides interesting and informative commentary on individual cartoons, his relationship with Sparky and the experience of working on the ultimately unsuccessful feature. This book reprints the entire run of the newspaper strip with one panel per book page. Even the dingbats from the feature's title header are dutifully included. It's a small format book but the panels are printed at a nice large size, probably as least as big if not even slightly larger than they originally appeared in newspapers. The reproduction quality varies; obviously some of the panels are scanned from tearsheets and the reduction of colors to greyscale is sometimes not all that attractively handled. However, the majority of the cartoons seem to be from old black and white proofs (or more deftly restored) because they are gorgeously crisp. Obscurity of the Day: What a Guy! After an already successful career in gag cartooning and greeting cards Bill Hoest quickly became a very successful syndicated cartoonist when The Lockhorns debuted in 1968. The panel, which featured a bickering married couple, was certainly no groundbreaking new idea in comics. However, Hoest's appealing art and the almost infinite adaptability of the Sunday version, which could be used to fill almost any space in a Sunday comics section, gave it a leg up on the competition. Hoest was a bit of a workaholic, though, and one hit feature wasn't enough to keep him as busy as he liked. Several others followed which were also successful -- Bumper Snickers for National Enquirer in 1974, Agatha Crumm in 1977, and Laugh Parade for Parade magazine in 1980. Hoest's last effort before his untimely death in 1988 at age 62 was What a Guy!, which debuted from King Features on March 29 1987. Unlike the others, this one didn't seem to find a very enthusiastic readership. The premise is that an elementary school kid named Guy is obsessed with the idea that he's a businessman. He wears a frumpy suit, has a middle-age paunch, worries about ulcers, the whole nine yards. The idea was timely in the go-go 1980s, but Hoest didn't get there first -- the Guy character is strongly reminiscent of Alex P. Keaton from the hit TV sitcom Family Ties. The popularity of the TV show was probably seen as an asset, but it didn't seem to have the desired slingshot effect to propel What a Guy! into newspapers. The feature at first used the tried-and-true model of The Lockhorns for the Sunday page -- a group of panel cartoons that could be rejiggered into many different formats. For unknown reasons this format was dropped in 1988 and the Sunday became a strip feature. From the beginning the daily was in strip form instead of a panel, though the 'strip' was almost always a single panel. When Bill Hoest died in 1988, assistant John Reiner took over the art reins on all of the features, including What a Guy!. On August 7 1989 he was awarded a credit on the feature, perhaps when Bill Hoest's backstock ran out. On that same date Bill's widow Bunny Hoest, who had long collaborated with her husband on gag-writing, also began taking credit. What a Guy!, the only real dud in the Hoest feature list, was finally given the pink slip in 1997 (exact date unknown), along with the more popular Agatha Crumm. The two features only claimed to be in about 50 papers each when they were retired, which seems a liberal figure in the case of our obscurity. Bunny Hoest commented that she was dropping the features to concentrate more on The Lockhorns, whose 500 paper list dwarfed the others. Although the feature was never a hit, two reprint books were produced. Tor published What a Guy! in 1989 and What's The Latest? in 1990. Since you have 1986 as a start date, my information is probably incorrect, but I noticed that the Mimai Herald started it on Sunday March 29 1987, and the Toronto Star announced it on March 30 1987. The year 1987 is also confirmed by the Howard Huge website (seems to be kind of official?) No idea about the end date though. Thanks very much for researching that Fram. On further checking the 1986 date was bogus -- the King Features ad section in the 1987 E&P directory calls it a brand new feature, so 3/29/87 it is. Post has been fixed. I remember this fondly. I didn't realize it was all that obscure! Well, nothing seems obscure if it ran in your hometown paper. Luck of the draw. What more really needs to be said than Best Comic Strip Title Ever! 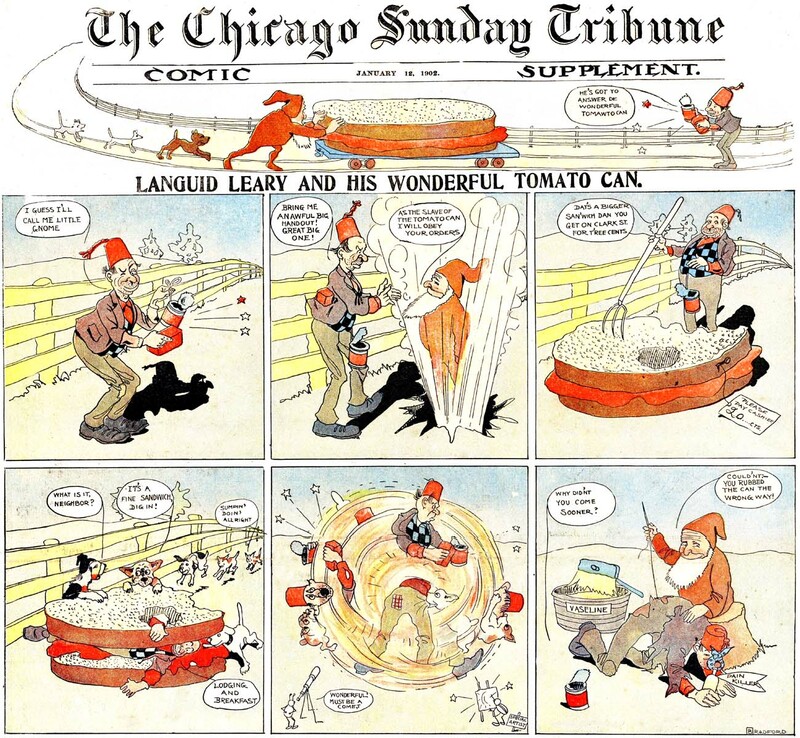 Languid Leary and his Wonderful Tomato Can came from the fertile pen of Walter "Brad" Bradford in his early days at the Chicago Tribune. Although long-forgotten, Brad is on my short list of the funniest cartoonists ever. Every pen stroke and every word is pregnant with comedic genius. Languid Leary is a play on the old Aladdin tale with a tatterdemalion standing in for Aladdin and an empty tomato can for the lamp. Only Brad could be so inspired and then follow through with just a few hilarious strips on the subject, then throw it away in favor of his next big idea. 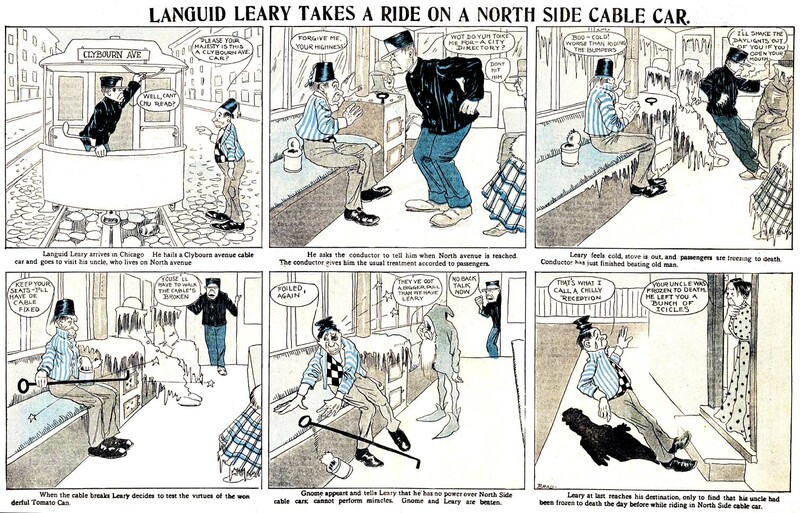 Brad was no slave to continuity either, as we note in the final strip that Leary has turned into a typical commuter for Brad's skewering of Chicago's north side trolley service. 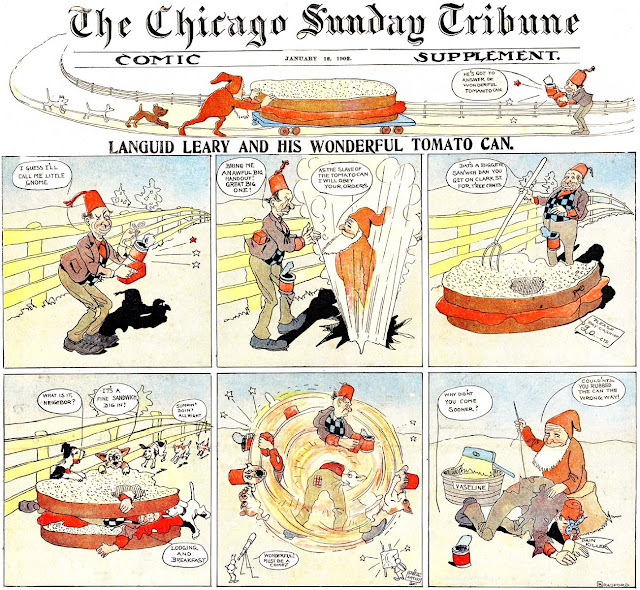 Languid Leary and his Wonderful Tomato Can ran in the Trib from January 5-26 1902. Cheers and applause to Cole Johnson, who provided the gems above.